The San Francisco Book and Paper Fair held center stage in northern California over the first weekend in February. The fair, an every other year opportunity when the ABAA Fair goes to Southern California, leaves the city and convention center available for a mixed group of ABAA and non-ABAA members to exhibit to a collecting audience that wants a major book and ephemera fair every year. This year, for the first time the fair was organized by Nancy Johnson, her firm, Nancy Johnson Events Management, the inheritor of years of events long held by Walter Larsen and Associates. Mr. Larsen is now retired. By many accounts the fair was very worthwhile. One eastern collector-dealer reported spending more than $35,000. Other random reports suggest both collectors and dealers did well. As one buyer explained it “this year’s fair had a ‘scavenger’s’ feel. The material was deep and attractively obscure.” Collectors like to be surprised. Show promoters tend to round up on traffic estimates but no rounding was required for this fair. The next-door parking lot told the story and it was full both days. The only glitch reported was a snafu in the printing of the show catalogue that included a map of exhibitors that did not entirely comport with reality. This ensured that those relying on it to move from one chosen booth to the next needed to search every space down to the farthest corners. Fortunately most people were content to search everywhere and those that did were doubly rewarded in finding both the dealers they sought and others with appealing material they might otherwise have overlooked. 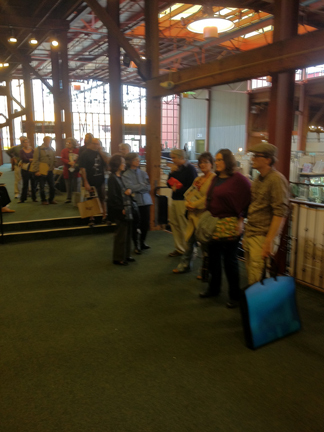 On Sunday volunteers offered opinions on material brought in by visitors to be appraised a la the Antiques Road Show. The line was long and the expectations high. No Gutenbergs were identified but one of the appraisers described the material as very good. San Francisco deserves a great book fair every year.